Let’s start with a short overview of the user interface of the LevelFX Studio. Enter a name for your project and the location where all of its files should be saved. It’s recommended to create an own folder for your project. Now a bunch of folders were created which can be seen in the project tree on the left panel. The folder Levels contains of course your level files. The folder Textures contains all the graphical content of your game, divided into backgrounds, sprites and tilesets. The folder Audio contains sound files for the background music (BGM) and the sound effects (SFX) in your game. Before you can build your level, you are going to need some graphics first. You can either use some of the graphics brought with LevelFX, search online or create your own. By the way, the project tree shows basically the same as your project folder in the file system. So instead you can also copy-paste your files directly into the folders in your file explorer. After doing that you will have to refresh the project tree in LevelFX (right click somewhere in the project tree and go to Refresh). Tilesets are graphics which contain a collection of the tiles you will use to build your level. The tiles are organized in a square grid where the constant size of each square is called the tile size. 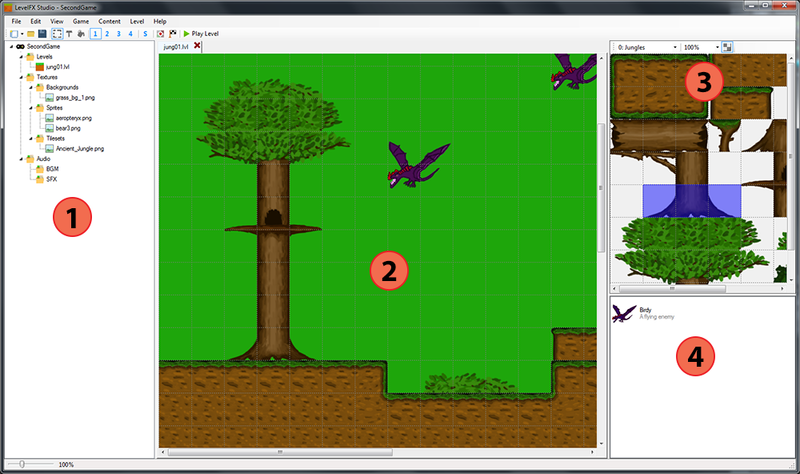 In LevelFX, Tilesets are created within the Tileset Editor and can be used in any level throughout the game then. Now that you’ve added your first tileset it will show up in the tileset editor. With the drop-down box in the toolbar you can select which tileset to edit. The next step is to edit the behavior of the individual tiles, if desired. In LevelFX each tile has a certain behavior, called Touch Event. The touch event describes how the player is interacting with the tile. Now to change the touch events left click on a tile to select it or drag your mouse around to select multiple tiles at once. Then in the Touch Event drop-down box select the event you want. Once you are done editing the tileset you can press OK in the tileset editor to save it. Now that you have added a tileset you can finally start with the level. Your blank gray level should now show up in the center of the window and in your Levels folder a new file should appear. By double-clicking on a level file you open it up in a new tab. Let’s start to fill your level with some tiles. In the toolbar you will notice some buttons with numbers from 1-4 and one with an ‘S’. With these you can select the layer on which to draw. 1-4 are the foreground tile layers (layer 4 is topmost), whereas S is the sprite layer (described later). You can also use the (1-5) number keys on your keyboard as a shortcut to switch between the layers. If you are already bored of the grey back color it’s time to add some background images to your level. Before you finally start playing the level you just built, you have to set a start point and optionally a goal point for your level. This can be done via the two buttons in the toolbar: Set Level Entry Point and Set Level Goal Point. Maybe your level is already great, maybe it’s not. In either case sprites can add a lot more liveliness to any level. In LevelFX, sprites are dynamic objects which are mainly enemies, hazards and other mechanics or, generally said, objects that move or perform any action. Sprites will most likely have a texture (which can be animated) and a certain behavior (e.g. walking around, jumping around, flying etc.). As with the tilesets, sprites have to be added first to your project, this time in the Sprite Editor. Enter the frame width and frame height. For non-animated graphics that will be just the dimensions of the image. For animated sprite sheets this will the width and height of one single frame. This will be used to display it correctly as well as to determine the hit box of the sprite in the game. Select a behavior for your sprite. In the future this will be replaced with a whole lot of customization tools, but for now you have to stick with these few preset behaviors. If you don’t like the default character or you have other plans you can create your very own player character. You can declare custom graphics, easily create different animations and customize a whole lot of behavior like the player’s physics. Now that we’ve set up the graphical appearance of our player, we want to change some behavior as well. Press OK at the bottom of the window to save the character. You can go back to the default character any time by selecting Use Default Character in the Character Editor. Mess around a bit with your level and be sure to press Play whenever you feel like playing it. There are some features which I haven’t explained here and of course a whole lot of new features will be coming soon. This article will be updated whenever there are major changes. Keep up and have fun designing your own levels!